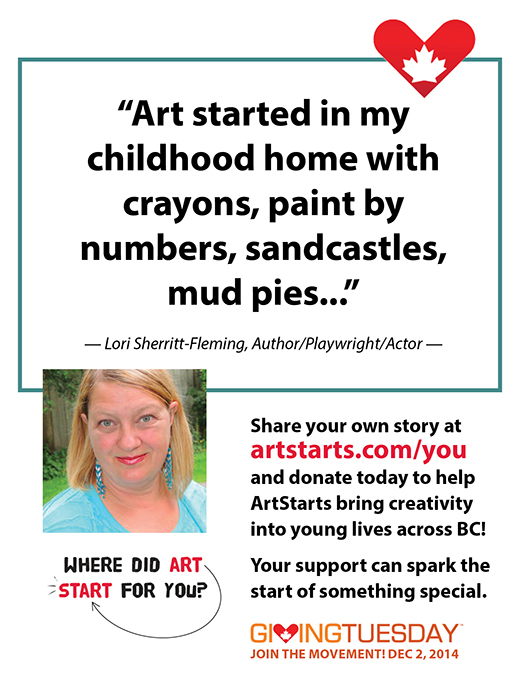 Art started in my childhood home with crayons, paint by numbers, knitting needles, sandcastles, mud pies, pieces of cardboard to colour on. the Sunday night oldies show blaring through the upstairs speakers and picture books, read aloud every night before bed. Art was gathering my siblings, herding them into the upstairs bedroom and pressing 'record' on my dad's tape player, then giggling madly as we listened to our squeaky voices singing pop tunes. Art was unlimited and imaginative enough to know how to transform dried tea leaves and a little white glue into frame able, organic masterpieces. It was paying careful attention when my grandmother taught me how to do the Irish jig and still being able to do it today. It was the telling and writing of stories, weekly visits to the library and a bookcase full of favourites that could be reread over and over. It was writing and directing skits at Brownies and presenting them on the church stage where we met. The first one I remember writing was one about aliens landing in our yard and how we had to learn how to communicate with them. In grade five, before I knew how to type, I wrote, produced, directed and starred in a play I wrote especially for my beloved teacher, Mrs. Lato. I remember using carbon copy paper to make copies of the hand written script (I'm giving away my age) and asking classmates to take on roles and show up at secret rehearsals at recess. I remember the enthusiasm with which people played the forest animals and the surprise and joy on Mrs. Lato's face when we performed Snow White and the Seven Dwarves for her and the Kindergarten class. I always strove to find artful moments and opportunities... always took every opportunity to dance, paint, sing, take photos. Art is part of my evolution, even today.